Having a gluten-free diet can offer a myriad of health benefits. Avoiding most wheat products can help improve your cholesterol levels, promote digestive health, and boost your energy. However, many people who opt for the gluten-free lifestyle find it difficult to locate food places that cater to their dietary restriction. Thankfully, Benvenuto’s Italian Grill, a gluten-free restaurant in Oshkosh is here for you. Whether you’re avoiding wheat products because of gluten sensitivity or personal reasons, you can still enjoy your favorite meals at Benvenuto’s Italian Grill. 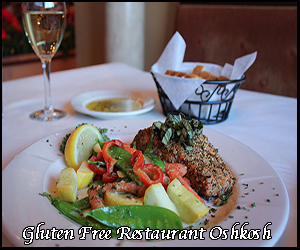 At our gluten-free restaurant in Oshkosh, we understand that people have different dietary needs. This is why the staff at our gluten-free restaurant in Oshkosh strives to accommodate guests with special diets. At our gluten-free restaurant, Oshkosh families can choose from various dishes in our extensive menu, which has been approved by the Gluten Intolerance Group ®. Our gluten-free restaurant in Oshkosh also offers low-gluten, meatless, and low-carb menu options. Are you having trouble finding gluten-free versions of your favorite Italian dishes? We have you covered. At Benvenuto’s Italian Grill, you can have gluten-free pizzas, pastas, and more! Who doesn’t enjoy eating cheesy, savory pizzas? At our gluten-free restaurant, Oshkosh residents with gluten intolerance can grab a slice of pizza without worries. Hand-stretched and wood-fired, the pizza at our gluten-free restaurant in Oshkosh has a unique, smoky flavor that families everywhere are sure to love. Our gluten-free restaurant in Oshkosh has a vast selection of pizza flavors and additional toppings available for you. Whether you’re in the mood for our classic margherita pizza or our healthy all-vegetable option, you can eat pizza to your heart’s content at our gluten-free restaurant in Oshkosh! Pasta connoisseurs are bound to love the wealth of flavors available at our gluten-free restaurant. Oshkosh residents visit our restaurant to enjoy a night of fine wine and elegantly prepared pasta dishes. Do you want to try portabella penne or cheese ravioli? We have them all. All of the pasta dishes at our gluten-free restaurant in Oshkosh include either a side salad or the minestrone soup. For many Americans, sandwiches are the go-to comfort food. They’re delicious, warm, and can come in different flavors. If you want an elevated and gluten-free sandwich, visit our gluten-free restaurant in Oshkosh. At our gluten-free restaurant in Oshkosh, people with gluten intolerance can try different sandwiches from our gluten-free menu. All of our sandwich options are made with a gluten-free bun and are served with a side dish of your choice. Try the Southwest Chicken or Hot Supreme at our gluten-free restaurant in Oshkosh! For the health-conscious food lover, nothing beats a good salad. When you’re in the mood for a healthful and nourishing meal, try the salads at our gluten-free restaurant in Oshkosh. Our gluten-free restaurant in Oshkosh has Cobb, Italian, and Southwest Chicken salads. You can also choose which dressing you want for your salad. We have raspberry vinaigrette, chipotle ranch, honey mustard, blue cheese, and more. No meal is complete without a great entrée. Whether you’re craving seafood or chicken, you’re bound to love the dishes available at our gluten-free restaurant. Oshkosh families can have our delicious entrées for lunch or dinner. Hungry for Italian cuisine? Benvenuto’s Italian Grill welcomes you and your family to have an unforgettable dining experience at our gluten-free restaurant in Oshkosh. Be our guests today!